Libyan leader Muammar Gaddafi praises the Tiananmen crackdown on protesters. It’s praise China can do without. I’m sure China’s leaders won’t be thanking Libyan leader Col. Muammar Gaddafi for his fulsome praise last night of China’s approach to the Tiananmen Square crackdown. 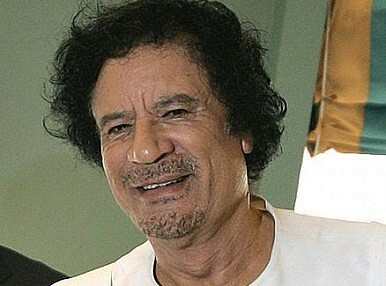 With pressure mounting for him to step down, Gaddafi launched a blistering attack on what he described as drug-fuelled ‘cockroach’ protesters who he claimed were ‘drunken and duped.’ Speaking for well over an hour, Gaddafi vowed to stay and fight on in Libya until the ‘last drop’ of his blood in a fist-banging display of furious rhetoric. In reality Gaddafi appears to have more than exceeded the 1989 crackdown, with numerous reports of warplanes being used to bomb protesters, as well as non-Libyan thugs being hired to terrorize citizens in their homes. Such an escalation against one’s own citizens is bizarre and deeply disturbing. As Matt Gurney noted in the National Post yesterday, when you start bombing your own capital, then the end really is near. China often finds itself in tricky positions over such developments, reluctant to condemn crackdowns on unrest for fear of drawing attention to its own ‘issues’ with democracy. But perhaps in part because it doesn’t want to get sucked into any association with a paranoid leader who seems so detached from the reality unfolding around him, China joined all other UN Security Council members in demanding an immediate end to the violence, and the immediate lifting of restrictions on all forms of the media. There is, though, a certain irony in this last demand—mainland viewers of CNN’s coverage of the speech found their screens going dark briefly last night when Gaddafi got to the point about Tiananmen. Fear, lack of information and a government crackdown killed the chances of a Jasmine Revolution here.